The Dominican Republic has long been a favorite for Canadians looking to escape the cold and explore the Caribbean. In fact, over 700 000 Canadians travel to the Dominican Republic to sit back, relax, and enjoy the sunshine. What may not be widely known is that the small island country has also experienced significant economic growth in recent times, with its GDP doubling within the last decade. This has made it an increasingly popular destination for foreign businesses looking to establish themselves in the Caribbean and many of these interested businesses come from Canada. Likewise, many Canadian tourists decide they want to extend their stay in the Dominican Republic and opt to find work, apply for a Dominican residency, or get married in the Dominican Republic. These long term endeavors require numerous accompanying documents such as certificates of incorporation, articles of incorporation, CPP certificates, ITC certificates, police checks, pension letters, and birth certificates. However, documents that are issued in Canada will not be accepted in the Dominican Republic in their original state. This is simply because Dominican authorities have no way of knowing if the Canadian documents being presented are authentic. You may have heard of the apostille process and it is possible that you have also been told to have your Canadian documents apostilled for use in the Dominican Republic. Although the Dominican Republic uses the apostille process, Canada has not signed the Hague apostille convention. Instead, Canada uses the process that was used prior to the apostille convention. This is a two step process known as authentication and legalization and it is equal to an apostille. Any Canadian document that needs to be used abroad will need to go through this process. Authentication and legalization take place at two separate locations. First, authentication takes place at Global Affairs Canada here in Ottawa. Then, legalization takes place at the consular section of the embassy of the Dominican Republic which is also located in Ottawa. Each step has a series of requirements that need to be met before it can be completed. For Global Affairs Canada to authenticate your Canadian document, it must contain a signature from a verified individual they have on file. There are also additional requirements which vary depending on the type of document. 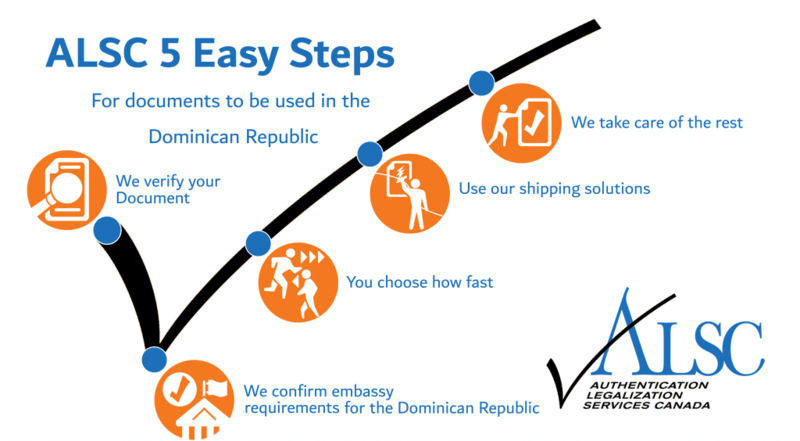 To be valid for legalization at the consular section of the Embassy of the Dominican Republic in Ottawa, your document must first be authenticated by Global Affairs Canada. Similarly, you will need to provide a series of requirements including payment to the Dominican embassy. Note that these requirements are subject to change. Finally, both authentication and legalization have an associate processing time for completion. Authentication can take up to 20 business days to complete for documents Global Affairs Canada receive by mail or courier (this does not include shipping time). The Dominican Republic embassy also has its own processing time for legalization which can vary substantially. As such, the total processing time can easily exceed a month and this is assuming that there were no errors along the way. For many, this is simply unacceptable; there are deadlines that need to be met in the Dominican Republic. This is why thousands of Canadians choose the cost effective alternative that can save them weeks of processing time: ALSC. For over 25 years we have been processing Canadian documents for use in the Dominican Republic and over 100 other countries. We have done this for all manner of individuals, businesses, law firms, pharmaceutical companies, celebrities, and even former Canadian prime ministers. We are experts in Canadian documents for international use from Medical Device Licenses, Corporate Powers of Attorney, and Certificates of Free Sale to Marriage Certificates, Degrees, and Court Orders. As the pioneers in our industry, we have worked hard to develop practices that have become the standard in our field of work. Our clients are all covered by our service guarantee: the assurance that your Canadian documents will be made valid for use in the Dominican Republic or elsewhere. Our services can save you as much as 20 business days off your processing time with our priority same business day authentication service. We also offer a standard 3 business day and economy 10 business day service which balance affordability with speed. When you choose our services you get your own personal agent who assists you from start to finish. They will help you put together the necessary requirements for authentication and legalization and will provide you with detailed updates at every step of the process. Not only that, but our agents are available at all times during our office hours to answer questions and resolve any concerns that may arise. 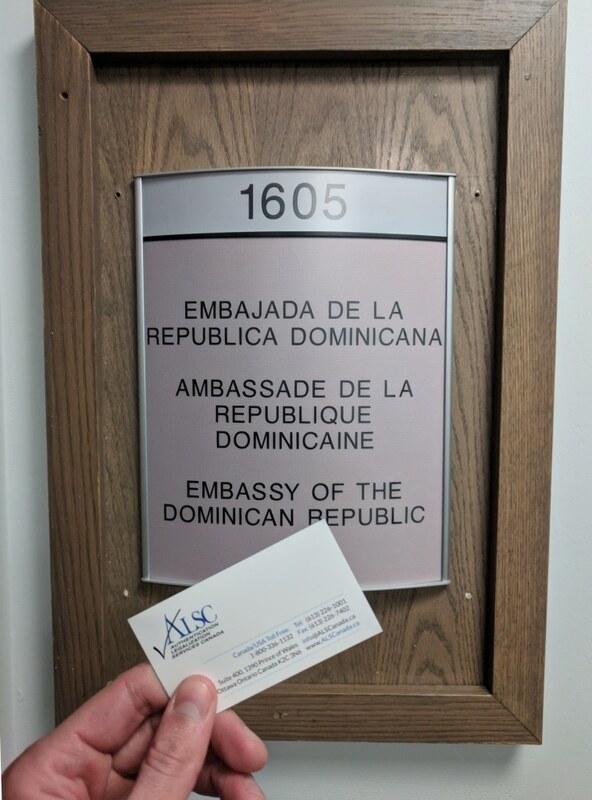 Although we cannot influence the processing time at the Dominican embassy, the professional relationships we have built with their consular staff enables us to be up to date on their changing requirements and fees, in some cases allowing us to know them before they go into effect. The reputation we have built with the Dominican embassy and many others across Canada makes us a preferred client, ensuring the smoothest legalization process possible; we always get it right. Once your documents have been completed we can send them anywhere in the world they need to go through one of our shipping partners at an affordable cost. If you have Canadian documents for use in the Dominican Republic, contact us. Our experts will take care of everything and you will receive the professional service you deserve. Feel free to continue reading for more information on Canadian documents for use in the Dominican Republic. The recent expansion of the Dominican economy has made it a fresh location for many businesses from around the world. The resulting wealth has also improved its healthcare markets, making it particularly appealing for pharmaceutical companies from around the world who are seeking to open subsidiaries in the Dominican Republic, export their pharmaceutical products to the Dominican Republic, or partner with existing Dominican corporations in the medical field. These endeavors will require a series of corporate documents such as Certificate of Pharmaceutical Product Certificate, International Trade Certificate, Good Manufacturing Practice Certificate, Certificate of Free Sale, Manufacturer’s Certificate, and Authorization Letter. The exact documents you will require will depend entirely on the demands of your affiliates or requesting parties in the Dominican Republic. As an existing Canadian corporation, you may already be familiar with how to get many of these documents and might even have some in an accessible location. Canadian corporate documents will require notarization by a Canadian lawyer or notary public to be valid for authentication at Global Affairs Canada. If you have already notarized your corporate documents, take a minute to check that the stamp, seal, and signature all match and that the name of the signatory is legible. A failure to do so can cause delays since Global Affairs Canada requires that the documents be properly notarized and that the name is legible so they can authenticate it. Finally, ensure you clarify exactly which documents you will need with the appropriate parties in the Dominican Republic. Processing all your documents at once will be more efficient and less costly, yet there are many clients who turn back to us at the last minute to process additional documents they were unaware of due to poor communication. As such, make sure you know exactly which documents you need before contacting us. Canadian vital statistics documents are seldom used within Canada but are some of the most frequently requested documents for use in the Dominican Republic for personal foreign affairs. These include Canadian birth certificates, marriage certificates, and death certificates and their associated importance to attaining employment, Dominican citizenship, getting married in the Dominican Republic, or resolving inheritance matters in the Dominican Republic. As one of the most frequently used Canadian documents overseas, vital statistics documents are also some of the easiest to process. This is because they come issued with signatures recognized by Global Affairs Canada which makes them valid for authentication in their original state. It is important to keep in mind that only documents issued from the appropriate vital statistics offices can be accepted for authentication at Global Affairs Canada. Marriage certificates issued by the church and death certificates issued by the funeral home are not valid for authentication even if they have been notarized by a lawyer or notary public. Although notarized copies of your vital statistics documents can be made, these can be more expensive than simply ordering a new original, which is always preferred for international processing. Furthermore, if you are planning to get married in the Dominican Republic the Dominican embassy has additional requirements that need to be met. We can assist you with these when you use our services. If you need to order your Canadian birth certificate, marriage certificate, or death certificate we recommend you have it sent directly to our office to save processing time. Many of our clients choose to do this and they are glad that they did! Refer to the links below. Getting your Canadian documents ready for use in the Dominican Republic can be very difficult, but it doesn’t have to be. We understand that it may be difficult to trust a third party with your sensitive documents. Every year, thousands of Canadians trust ALSC with their documents for use overseas. Our numerous 5-star reviews on Facebook and Google, our A+ rating with the BBB, and our proud membership with the Canadian Chamber of Commerce that we are not only trustworthy, but the best option when it comes to authentication and legalization services. Our leading position hasn’t stopped us from looking for ways to improve our services for our clients. In recent years we have worked hard to open over a dozen service centers across Canada. Once you have made an appointment through our head office, when you use our service centers you get free shipping to our head office in Ottawa for processing via FedEx and save yourself the hassle of going to the post office. Once your documents have been completed and are ready for use in the Dominican Republic, we can send them back to any one of our service centers via FedEx free of charge once again, or send them anywhere else in the world they need to go at an additional cost. Save yourself time and stress and trust ALSC with your Canadian documents for use in the Dominican Republic.